Helical springs keep the valve lids closed when the pressure value remains within the preset limits. The three outside spring rods keep the external ring-shaped lid firmly closed as long as the force generated by the pressure inside the silo does not overcome the spring force. 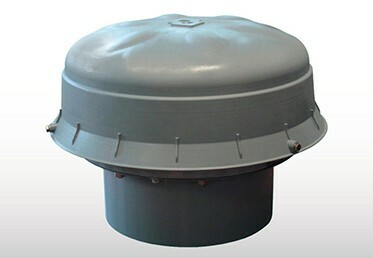 VCP-D Pressure Relief Valves consist of a cylindrical casing with a bottom flange to be connected with a spigot welded on the silo roof, a disc shape inner polymer lid for negative pressure operation held in position by a central spring rod, an outside steel ring for excess pressure kept in position by three spring rods, gaskets, and a weather protection cover.